ROBERT O’ROURK FILE PHOTO | Riverhead senior Dan Normoyle. For a track and field team to have one elite pole vaulter is a luxury. To have two? Even better. But three? That’s just hard to imagine. But in 2013, the Riverhead Blue Waves had one of the most formidable pole vaulting trios any team could ever hope for. Dan Normoyle, Jonah Spaeth and Charles Villa were often competing against each other at meets to determine the champion. And at any given meet, it could be any of the vaulters with a top mark. At the state championship for the indoor season, Normoyle cleared 14 feet 6 inches and Spaeth cleared 14. In the outdoor season, Normoyle and Villa qualified for the state championship. Normoyle again cleared 14-6 and Villa cleared 14. To qualify for states, Normoyle cleared 15 feet as the Blue Waves finished 1-2-3. It’s been a record-setting year for Riverhead senior Dan Normoyle in the pole vault. From the winter track season straight through the spring season, Normoyle and his Blue Wave teammates continued to impress with their ability to clear higher and higher heights. Normoyle was one of several local athletes who wrapped up the spring season by competing this weekend at the New Balance Outdoor Nationals in North Carolina. Normoyle, a senior, competed in the emerging elite division for the pole vault and finished in 11th place. He cleared 14 feet 8 1/4 inches. Eleven vaulters finished at the same height, including third-place finisher Josh Hopkins from Massachusetts. Two vaulters topped that mark. Dylan Altland of New Jersey and Ian West of North Carolina both cleared 15-02 1/4. Altland took first based on fewer jumps. More than 40 vaulters competed in the competition. Shoreham-Wading River junior Ryan Udvadia ran the two-mile championship race and finished 18th in 9 minutes 21.43 seconds. Two runners cracked 9 minutes, including Sean McGorty of Virginia who ran 8:45.61 to take first place. Shoreham also had a girls 4 x 800 relay team run at nationals. The quartet of Laura Lee, Makayla Meeker, Rose Andrews and Kaitlyn Ohrtmann ran 9:43.71 to finish ninth in the emerging elite division. Before the proceedings began, Dan Normoyle dubbed the occasion “Big Pole Saturday.” It was appropriate enough, with the 29 best high school boys pole vaulters in the state competing in the New York State Public High School Athletic Association Championships at Middletown High School. The theory is that the longer the pole, the higher it will propel pole vaulters through the air. Normoyle, though, actually used two poles of the same length: 15 feet, one a little thicker than the other. Afterward, he acknowledged that, in his case at least, it wasn’t “Big Pole Saturday.” Normoyle didn’t quite go as high as he would have liked, but the Riverhead senior still turned in the third-best performance in the competition, and that’s not bad at all. Normoyle cleared 14 feet 6 inches, finishing behind Justin Farrenkopf of Ellenville (15-0) and James Steck of Shaker (14-6). Another Riverheader, junior Charles Villa, was ninth at 14-0. That includes the meet favorite, Warwick Valley junior Todd Uckermark, one of two pole vaulters who failed to clear a height. Because of heavy rain on Friday, the scheduled two-day meet was condensed into one day. Normoyle said he was in a better mental state to compete on Friday. Instead, he went to lunch with his parents and saw a movie that day. Villa entered the competition at 13-0, and Normoyle started at 13-6. They both made heights without missing to be among the 12 pole vaulters still standing after reaching 14-0. For some of the athletes, that height represented a ceiling. Both Riverheaders passed on 14-3, going straight to 14-6. That’s when Villa ran into trouble, fouling on his first two attempts and then failing on his third and final one. Normoyle made good on his first attempt at 14-6, but he couldn’t handle 14-9, although he came awfully close on his final try, just nipping the bar. “I just didn’t have the rhythm today, I guess,” said Normoyle, who gave up playing football to devote himself to pole vaulting. Normoyle may have been disappointed, but his coach, Steve Gevinski, wasn’t disappointed in him. “I thought he was amazing, just the strength and the speed he showed was unbelievable,” said the Riverhead coach. Friday’s postponement made life difficult for Shoreham-Wading River junior Ryan Udvadia, who had to run two long-distance finals on Saturday as a result. Udvadia clocked a time of 9 minutes 10.24 seconds to take sixth place in the 3,200 meters, which saw Nick Ryan of Fayetteville-Manlius triumph in 8:58.28. Ryan nearly pulled off an impressive double later in the day, with only a few hours to recover. He was nipped at the finish line by Eric Holt of Carmel in the 1,600 final. Holt’s winning time was 4:07.00, just 55/100ths of a second faster than Ryan. Udvadia was eighth in 4:17.11. Two Mattituck athletes made their first appearance in the state meet. Darius Brew, a freshman and the youngest competitor in the triple jump, came in 23rd place with a distance of 40-3 1/2. His teammate, junior Sal Loverde, did not have one of his better days, throwing 126-0 for 28th place. The winning throw was 181-9 by Jericho’s Noah White. CARTER SETS HER BEST TIME IN 100 Bishop McGann-Mercy’s Danisha Carter posted a personal-best time in the 100 meters. The junior was 16th in the 100 in 12.89. She was 13th in the 200 in 26.32. McGann-Mercy was represented by another athlete at Middletown’s sparkling Faller Field. Delina Auciello, a junior celebrating her 17th birthday, was reportedly not feeling well with a stomach ache, but still competed in the 3,000 finals. She finished 25th in 11:28.73. Competing in the state meet can be a humbling experience. Even top runners can find themselves near the back of the pack. 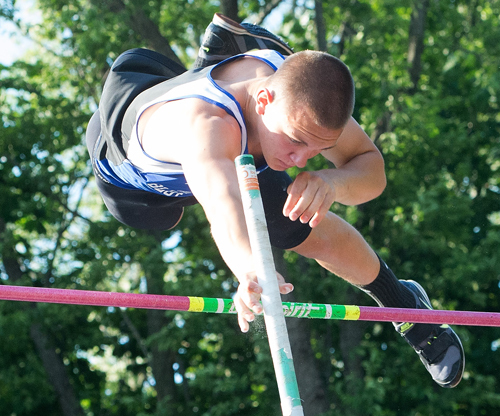 ROBERT O’ROURK PHOTO | Riverhead senior Dan Normoyle cleared 15 feet, breaking his own school record by 3 inches. He took first place while teammates Charles Villa (14-0) and Jonah Spaeth (14-0) were second and third, respectively. Dan Normoyle has a personal motto that he is ready to offer whenever he is asked how high he can pole vault. “The sky’s the limit,” he says. It’s an apropos motto for a pole vaulter. Pole vaulters, after all, are a special breed. They are adventurous, courageous, often free-spirited, and they tend to not put limits on themselves as they soar to greater and greater heights. They are dealing with a flukish event in which so many things can go wrong. But on Friday, so many things went right for Normoyle and his fellow Riverhead pole vaulters. It was as simple — and impressive — as one, two, three. Riverhead pole vaulters, led by Normoyle’s record-setting performance, swept the top three places in the Section XI individual championship state qualifier at Port Jefferson High School. Normoyle, a senior, cleared 15 feet on his last attempt at that height, surpassing the school record of 14-9 that he set last week in the division championships. But that wasn’t the only notable element of the day’s proceedings. Riverhead junior Charles Villa took second place at 14-0, edging teammate Jonah Spaeth, a senior who also cleared that height, by a tiebreaker. “Being able to say we took one, two, three in the county championships is really cool,” said Normoyle. Normoyle missed all three of his attempts at 15-5. “Fifteen-five would have been nice,” said Normoyle, who qualified along with Villa for the New York State Public High School Athletic Association Championships that will be held June 7 and 8 at Middletown High School. The three Riverheaders were among the top four seeds in the meet, with Normoyle the favorite. A persuasive argument could be made that this is the golden era for Riverhead pole vaulting. Riverhead coach Steve Gevinski thinks it is. It is the third time this season that Riverhead’s pole vault record was raised. Spaeth set a school record last year when he reached 14-6. Then, earlier this season, Normoyle and Villa both cleared 14-6, leaving a three-way tie for the school mark that lasted for about five minutes before Normoyle hit 14-9. Spaeth, who went to the state meet last year, will miss out this year, but Normoyle and Villa will make their first appearances in the state competition. ROBERT O’ROURK PHOTO | Ryan Udvadia of Shoreham-Wading River made up ground quickly and surged to victory in the 3,200-meter final in 9 minutes 17.27 seconds. UDVADIA GIVES SZYMANSKI A SCARE Shoreham-Wading River coach Bob Szymanski was kidding — or at least it sounded like he was kidding — when he said he thought he was going to need a defibrillator as he watched the thrilling finish to the 3,200-meter final. Shoreham-Wading River junior Ryan Udvadia trailed Northport sophomore Mike Brannigan by about 25 meters with some 200 meters to go, and Szymanski appeared to be panicking, worrying that Udvadia had given Brannigan too much of a cushion. Not so, though. The top-seeded Udvadia made up ground quickly, taking the lead for the first time while coming off the final turn and winning in 9 minutes 17.27 seconds. Szymanski could do without that kind of drama. Brannigan ended up in third place in 9:23.72. He was passed by a teammate, junior Tim McGowan (9:20.60), for second place. Another Shoreham junior, Connor McAlary, was 10th in 10:01.37. Riverhead junior Travis Wooten came in 18th in 10:22.77. Udvadia said he was nervous, but confident at the same time. He sensed Brannigan starting to slow down with 400 meters to go. Known for his late kick. Udvadia had something left in the tank for the strong finish. An example was the Penn Relays earlier this season. Udvadia was seeded 14th in the 16-runner 1,600 race. He went from dead last to finish seventh in 4:15.64. TRACK NOTES Shoreham-Wading River sophomore Israel Squires finished fourth in the long jump, covering 21-9. ROBERT O’ROURK PHOTO | Riverhead senior Dan Normoyle had little trouble on his entry height, easily clearing 13 feet 6 inches in the pole vault Thursday night at Connetquot High School. At 7:13 p.m. Thursday night — the majority of events at the track and field division championships already completed — Riverhead senior Dan Normoyle sprinted down the pole vault runway for his first run-through. For more than three hours, Normoyle, wearing sweats over his uniform, watched pole vaulter after pole vaulter compete in the division championships at Connetquot High School. Finally, it was his time. Electing to enter the competition at 13 feet 6 inches, Normoyle began at a time when 32 pole vaulters had already bowed out of the competition, leaving just four athletes still standing. He had reason to be confident. He easily soared over the bar at 13-6. And about 45 minutes later, in an intense competition featuring four outstanding pole vaulters, Normoyle set an outdoor school record by clearing 14-9. What made the competition so great for Normoyle was the fact he was competing against two of his teammates. Sophomore Charles Villa set a personal best by clearing 14-6. He came awfully close on his second attempt at 14-9, just nicking the bar with his chest as he glided over. Smithtown West senior Karl Nilsen matched Villa by clearing 14-6, but couldn’t equal Normoyle. Riverhead senior Jonah Spaeth was fourth in the competition by clearing 13-6. Normoyle attempted 15 feet three times just before the lights shut off at Connetquot. Nilsen, who was persevered through a leg injury, was the first to clear 14-6 on his second attempt. Normoyle matched him on his next attempt, leaving it up to Villa to join them at the next height. On Villa’s third attempt he topped 14-6 for his personal best. The four pole vaulters from Division II cleared higher heights than any pole vaulter from Division I or III. ROBERT O’ROURK PHOTO | Riverhead senior Dan Normoyle, shown at the Long Island Elite Track Invitational, set a school record Friday at the New Balance Indoor Nationals. At the New Balance Indoor Nationals Friday, Riverhead senior Dan Normoyle cleared 15 feet 3 1/2 inches to set a school record in the pole vault. Normoyle was one of three Riverhead pole vaulters to compete at the meet in the emerging elite division. ROBERT O’ROURK FILE PHOTO | Riverhead senior Dan Normoyle set a school record Friday in the pole vault at the New Balance Indoor Nationals. Riverhead senior Dan Normoyle set a school record Friday by clearing 15 feet 3 1/2 inches in the pole vault at the New Balance Indoor Nationals at The Armory in New York. Normoyle finished second in the emerging elite division behind Sean McEvoy of Fordham Prep, who cleared the same height but took first based on the number of jumps. Normoyle came into the meet after a fifth-place finish at the New York State Championships last weekend when he cleared 14-06, which matched the previous record also held by senior Jonah Spaeth. Spaeth had an impressive showing as well at the Nationals, clearing 14-03 1/2 for fourth place. Junior Charles Villa also competed in the competition but did not clear an opening height. It’s been a banner year for the three pole vaulters this winter. The Blue Waves nearly sent all three to states. And at the Long Island Elite Track Invitational Feb. 23, all three cleared 14 feet, a rare feet in the pole vault. “It’s never been done on Long Island, I don’t believe, certainly not in Riverhead,” Riverhead pole vaulting coach John “Doc” Andresen said after the meet. The Indoor Nationals continues today and Sunday. Click here for live video coverage. ROBERT O’ROURK FILE PHOTO | Riverhead senior Dan Normoyle, shown at the Long Island Elite Track Invitational, cleared 14-06 at the state meet Saturday for fifth place. Like a pitcher in baseball, a pole vaulter has only so many jumps in him during a meet before fatigue begins to set in, making it more and more difficult to soar over the bar as the height increases. The key for pole vaulters is to find the ideal height to enter the competition. Enter too early, risk fatiguing at the end. Enter too late, risk not clearing the initial height at all and falling into last place with the dreaded NH, or no height. At Saturday’s New York State Championships in Ithaca, Riverhead pole vaulters Dan Normoyle and Jonah Spaeth entered with lofty goals in pursuit of the top spot on the podium. The two seniors have routinely cleared 14 feet this season, giving them the confidence to wait until the bar already reached a high height before entering the competition. Normoyle began at 13 feet 6 inches, a height 12 out of the 26 vaulters failed to reach. When it was over, he had soared over 14-06, landing him fifth among public school competitors for a spot on the podium. It was his first all-state finish. He was sixth overall in the federation, which includes all schools in the state. Spaeth cleared 14-0 to narrowly miss a spot on the podium. He entered the competition at 13-0. “Both Dan and Jonah had very respectable performances and should be very proud of themselves,” Loverde said. James Steck, a senior from Shaker, won the competition by clearing 15-0. Two vaulters cleared 14-09. Loverde said both vaulters hoped to go as deep into the competition as possible. Monday marked the first official spring practice and the two vaulters wasted little time getting right back out there. Along with junior Charles Villa, who narrowly missed earning a spot at states, the trio pulled out the mats for their first outdoor practice. Coming off their success in the winter, there’s no telling what the trio can achieve in the spring, where vaulters typically jump higher. And when dual meets begin, the Blue Waves can just about mark down a sweep in the pole vault for every meet. Loverde said a more consistent practice schedule in the spring tends to allow vaulters to reach greater heights. Before the winter season officially reaches the end, Riverhead’s three vaulters will compete at the New Balance Indoor Nationals at The Armory in New York. The three-day competition begins Friday. They’ll get another chance Friday.